It’s hard to argue that the ideas behind the Porsche Club of America don’t make perfect sense. Someone in a position to own, lease, rent, or even borrow a Porsche wants to enjoy driving it, right? It doesn’t make much sense then, to get behind the wheel of one without knowing exactly what to do when one hits a slick road surface, or needs to swerve to avoid an accident, or simply has to stop suddenly. “What we teach is simply what I’d like to see the State teach drivers,” says Russ Castagna of South Boston, chief instructor of the Porsche Club’s Northeast Region Driver Education program. Castagna and other instructors in the Northeast Driver Ed program will sit next to Porsche drivers (as well as those with memberships in clubs devoted to certain other high-performance makes), and show them exactly what to do in virtually any situation. In fact, they’ll start instructing before anyone even takes a seat in the car. Lest one get the impression that participating on the program is somewhat remedial… it’s not. In fact, it’s pretty cool. Sessions are held at places like New Hampshire International Speedway, Rausch Creek Raceway, in Pennsylvania and Mont Tremblant in Quebec. So what do you do when you finish a driver Ed session? Well, you can move up the Porsche Club’s ladder. There are four different, color-coded levels of instruction – some don’t require an instructor seated next to you – with a fifth and final step up to instructor status. The more instruction one takes, the safer the student is likely to drive. Some leave it at that, other don’t. Porsche Club members in the Northeast region take part in a number of rallies and tours, and those who’d like to test their driving abilities a bit more, compete in AutoCross events – similar to obstacle courses – held monthly at Fort Devens. For those who really want to see what they and their Porsches can do, the club does hold competitive races. Castagna is one of the exceptions. Although he joined the Porsche Club in 1986, he didn’t get into the club racing program until 1996 – and took to it almost immediately. By last season, he had won races in his class at Lime Rock Park in Connecticut, Mosport in Ontario, and Watkins Glen in New York, and finished second in Pocono in Pennsylvania. He finished second in Class C at Road Atlanta, where he finished ahead of several GT competitors driving more powerful Porsches that have been radically altered. His racing endeavors keep him in close contact with Kevin Saltzman, a Plymouth native who began a nearly lifelong affair with the Porsche brand by haunting the shop at Rietzl Porsche/Audi. “I got a lot of great training,” says Saltzman, who began working for Wolfgang Rietzl upon his graduation from Plymouth-Carver High School in 1975. Saltzman, who now lives in Abington and runs his Randolph Racing shop in Stoughton, can now do just about anything to a Porsche. His bread and butter is the repair work he does on Street Porsches at his shop, but he also does more than his share of work preparing cars for the Driver Ed program, as well as modifying them for the more competitive club racing drivers like Castagna. Saltzman doesn’t race (although he has participated in Driver Ed), but he loves the Club Driving concept and attends many of his clients’ events. “It’s very tightly sanctioned,” Saltzman said. “They don’t put up with NASCAR-type bumping. You can’t hit anybody. To make sure the spirit of fun doesn’t get lost during the intensity of competition, the Porsche Club has what’s called the 13/13 rule. Drivers found at fault in a mishap are placed on probation for 13 months. If they’re found at fault in another incident during that probationary period, they can’t race for 13 months. Saltzman will soon be busy preparing for the Northeast Region’s Club Racing events at Lime Rock (May 4-5) and Pocono (June 2-3), plus the June Driver Ed session in Pennsylvania. 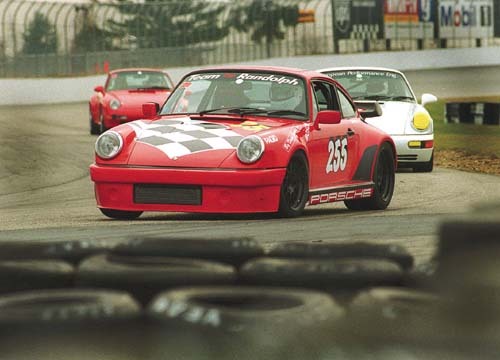 The Porsche also has a novice AutoCross scheduled for Sunday at Fort Devens, plus monthly events thereafter. It’s not what Castagna ever expected when, while awaiting service on one of his cars one day, saw a picture of a Porsche Club event and asked what it was about. “I guess my image of the people in the club wasn’t a good one,” he said. “I was expecting snobs or something, but my perception was wrong. “These are just good, working people who want to enjoy the cars they drive as much as they can.